CLEARANCE -- Hurtta Dog Raincoat. Order this Hurtta product and get FREE STANDARD SHIPPING (US48) on your entire order! 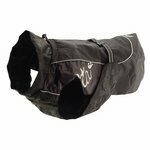 The Hurtta Dog Raincoat has a buckle attachment on the back which makes it easy to put on your dog. 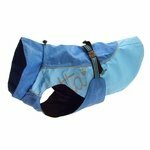 The abdomen piece helps protect your dog's chest and abdomen area. Available in Black, Red, or Blue.